Let me start this off on an improbable foot by saying I’m not huge on the concept of New Years resolutions, per se. But I do value reflection and improvement. And if just after the winter solstice seems like a good time for it, don’t let me stop you. Last fall, I began participating in a mastermind group. If you have a W2, your employer will typically offer you rather paternalistic guidance under the heading of career development. I call it paternalistic, since it generally assumes that your goals include working for the company forever, and emulating the people that have worked there forever. But, set that aside, and you can often extract a bit of value from it. For instance, you’ll get someone’s take on how to secure a promotion or get assigned to a better project. If you go the solo consultant or entrepreneur route, nothing like this really exists. I don’t think someone has used the words “exceeds expectations” in front of me for about 5 years. This I attribute to the fact that nobody uses those words outside of the corporate performance review. And I haven’t had one of those in half a decade. A mastermind group, more or less, fills that gap. A few people get together at some interval (weekly, for instance), brainstorm, share ideas, hold one another accountable, and offer mutual advice. Pound for pound, this offers much more individual value than the corporate perf review/boss one on one because it focuses entirely on my goals, not my goals in the context of being a perpetual good solider. At one of the mastermind group calls, we laid out goals for 2017. Not having done this before, I lurked more than participated, to see what sorts of goals these meant. The other participants laid out real plans, with real numbers, to do things like change revenue by X% or shave Y% of time off of some operational concern. I came to the table with vague notions of, “I want to spend less time in cold places.” Part of this results from my tendency to let lifestyle goals dictate work arrangements. But part of this comes from sloppiness and the consultant’s peril of not taking one’s own advice. I constantly offer management consulting clients of mine the wisdom, “if you don’t measure it, you can’t improve it.” Management consultant and author Patrick Lencioni drives this point home. Improving operations, even very large ones, can often boil down to identifying key things worth measuring. I wasn’t doing this for my own work. At first, I struggled to think of what to measure. I’ve followed a fairly simple algorithm when it comes to taking on work. First, take enough work to fill my weeks. Then, when new opportunities come along, cull the least profitable. Repeat ad infinitum. This algorithm has served me well; I want for little in life besides, perhaps, time. But it’s also entirely reactive. I thought I’d look for better ways to qualify what I took on. I opened up my accounting software and started to categorize my income. At first, I didn’t really know what I should look for. I broke it down by client, by degree of collaboration required, by billing arrangement, by type, etc. 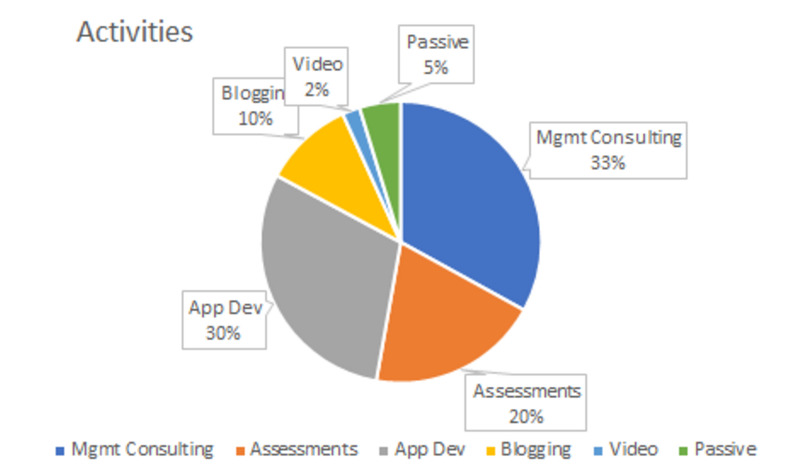 Then some kind of horrible project management demon seized me and I made pie charts, like this one (percentage of my income by line of business) from all of the categorizing I’d done. Next thing I knew, I had real, quantifiable goals. I listen to a lot of audio books. You can probably skip the most recent one, The 12 Week Year, as you get about 90% of the value just by reading the title. Not surprisingly, it suggests that you lay out quarterly, rather than yearly plans, since yearly plans have too much hidden slack time. With desired changes to my work distribution in mind, I could think in terms of actions by quarters. If end goal is 90% remote work, what cutbacks to site visits make sense for Q1 and Q2? If end goal involves getting content creation up to 50%, how much should I target each quarter? Can I reasonably achieve that in 2017? And so on. I cannot begin to tell you how much quantifying helps. Vague goals, such as “do more blogging,” wind up on the trash heap. Anything that you can achieve with a slight marginal effort or a herculean marginal effort falls out of mind quickly. We’re talking about the difference between resolving to “lose some weight” and “weigh 15 pounds less by April.” You can achieve the former by sitting in a sauna for an hour. The latter requires you to break down the broad goal into monthly and weekly terms, measure your progress, and keep at it. Companies tend to set largely un-creative goals. Usually this boils down to some variant of “grow like a virus because that’s what companies do.” Make more money for owners/shareholders. Add head count. Increase revenue. Reduce costs. Yawn. I have an eclectic portfolio of work and overarching lifestyle goals. For instance, I want to do more content work because I want location independence. I don’t want to increase revenue by 30% and add headcount because earnings. If you work as an employee, contractor, or solo consultant, your landscape looks a lot like mine, albeit potentially with less line of business diversity. This offers you a unique opportunity to come up with lifestyle-oriented, quantifiable goals. Though, it won’t necessarily come easily. Think of your own lifestyle and longer term goals (not your company’s goals — your goals) and build your own plan. Do you want to switch from working on legacy enterprise Java code to something more off the beaten path that diversifies your skills? Maybe you aim to spend 20% of your time at work developing in Scala by Q3 and you work backward on a step by step plan to make that happen. Do you want to increase your income by 10% in order to buy a boat? Maybe set a Q1 goal of negotiating a raise/promotion at your office and a Q2 goal of finding a new job, as a contingency. Work backward from there for a tactical plan. I can’t possibly cover everything you might want to do, so you’ll need to supply your own ideas. But I can give you the framework. Lay out what you’ve been up to, in quantifiable terms, take a critical look at it, and figure out what you want to change and by how much. With that in place as strategy, lay out the month over month tactics. Far better than general resolutions in the new year are quantifiable goals backed with well considered plans.